I made this for an activity on finding a number's neighbors on the hundreds chart. The object is to fill in the numbers above, to the side, and diagonally from the number that is alone. It's about a 1st-2nd grade activity. I used it as part of a lesson plan I had to make for a methods class. 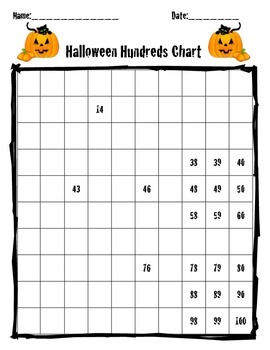 Introduce the chart by saying that the numbers would like to go trick or treating in their neighborhood, but they need to find their neighbors to trick or treat at - It's the student's job to find the number's neighbors. Some numbers have their neighbors all filled in - this is a built-in hint for students who need a little help figuring it out. It's a big time saver, and works better when they can figure it out themselves!